“Us” is the newest film from director Jordan Peele and tells the story of the Wilson family getting away from their busy lives by taking a vacation to Santa Cruz, California, but serenity soon turns to chaos when a group of doppelgängers begin to terrorize them. 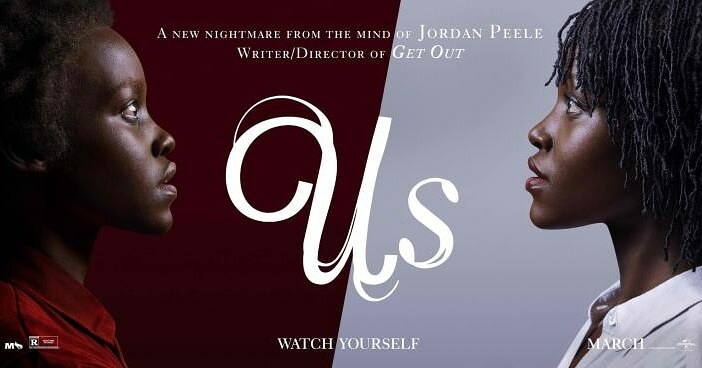 “Us” was my third most anticipated film of this year because I loved “Get Out”, Jordan Peele’s directorial debut film, so I was super excited to see what he had coming out next and he did not disappoint. “Us” is one of the best horror films I have seen in years, not necessarily because of the scares, but because how smart this film is and the way it uses this genre. The whole cast is fantastic, the two kids Evan Alex and Shahadi Wright Joseph were great, Winston Duke was really good and had great comedic timing, but this, this is Lupita Nyong’o’s show, she gives the best performance I have seen from her, and easily the best performance I have seen this year so far. The direction by Jordan Peele here is once again phenomenal. The man knows what he is doing and is smart with his decisions, it showed with “Get Out” and it shows here as well. He knows how to work with comedy, horror, suspense, and mix it all together and it works, he grabs you and does not let you go until the film is over. I really enjoyed the soundtrack, it had a very eerie, creepy, and classic horror vibe to it and it went very well with the film and I loved the film’s remix of Luniz’s “I Got 5 On It”, that is played at a perfect moment in the film, and also is on Youtube if you want to listen to it. I loved the cinematography done here by Mike Gioulakis and the lighting was really nice as well, with a nice hint of red in some scenes, overall just a very beautiful film to look at. It’s very hard to explain this film, but that is also a very big reason why I love it so much and why I find it to be so smart in its execution. To me this film is a modern day horror masterpiece, it is like nothing I have ever seen before, and it left me floored. This is a film that I think not only changes the horror genre in certain ways, but also suspense because of how smart it is and by knowing and doing exactly what the film is set out to do. In the end, you can obviously tell that I think this film is a modern masterpiece and I can do nothing else but recommend it, because this is a film that deserves to be seen, not only by you, but everyone you know. We don’t get films like this that often, so go support it.